Made in Admira's China factory by Spanish trained luthiers, the Alba delivers exceptional tone ideal for young students. 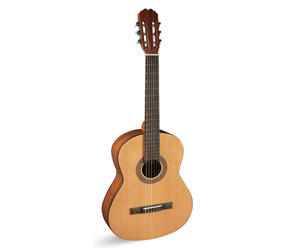 A combination of warm, full tone and low price tag makes this an ideal beginner instrument. 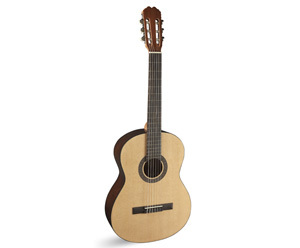 Made in China by Spanish-trained luthiers. The Sara is equipped with an Oregon Pine top, walnut back and sides, African mahogany necks, Indian rosewood fingerboards and bridges and Lyre design nickel machine heads a quality student instrument for the serious musician. A true value instrument. 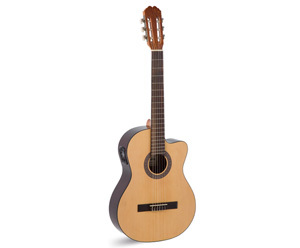 The Sara-EC electric cutaway guitar is constructed with an Oregon Pine top and walnut finish back and sides. The Sara-EC includes a preamp with 3 band EQ, piezo pickup and cutaway. A quality instrument for the serious student.